Protect your hair from heat damage with the Styler Vapor Fuel Refill from Joico. It's unique formula contains a blend of essential fatty acids, antioxidants, botanical moisturisers and featherweight silicones to repair and restore the hair's natural shine. 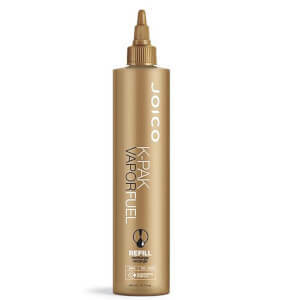 Joico's Quadramine Complex sinks deep into the hair to ensure it's repaired from the inside out. The liquid transforms into a vapour when in contact with extreme heat, meaning that all of the replenishing ingredients sink deep into the hair for an intensive effect.